Wikipedia describes this a a live action version although it is pretty much CGI from beginning to end. Actually it’s an excellent remake of the cartoon, with only one or two songs. We spend a bit more time finding out about Mowgli, why he’s in the jungle and about the wolves who brought him up. Most of the cartoon is retold in a slightly different way with each of the animal characters having their own motivations. 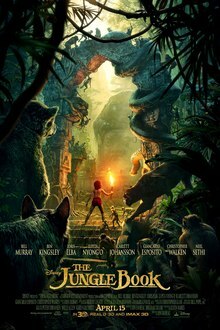 I liked the ending, with Shere Khan dead, Mowgli no longer ‘Has’ to leave the jungle and so he doesn’t. Vincent E Shearman is an science fiction and fantasy author. He is the author of the sci-fi novel London Wild and is currently working on a trilogy of fantasy novels.